FunFunFun Fest prides itself on including a large variety of genres of music, with diverse music enthusiasts in attendance. For six years the festival has been held in Austin Texas. This year many were excited to get to see trash-metal band, Slayer, and indie-pop princess, Lykke Li, during the same weekend. Acts such as Odd Future or Passion Pit were expected to be crowd favorites this year, but there were a few acts that surprised some with their large and ecstatic crowds earlier in the day. Two of these were tUnE-yArDs and Childish Gambino. tUnE-yArDs was one of the most well-received acts at the festival. From the very beginning, it was easy to tell that this band was very different. The stage was set up with two ‘pods’ of instruments including bass, ukulele, and many percussive instruments including drums and soda bottles. There were also two saxophones that added melodic ornamentation. 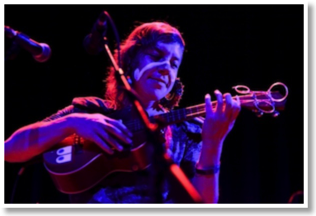 Merrill Garbus, the lead singer, began each song by recording loops of drums, ukulele, and vocals with a foot pedal that she utilized throughout the song. The tracks were sometimes dissonant, often nonsensical, but they came across as catchy and fun. Garbus’ powerful voice soared over the set, and her disjunct melodies were strong. She hit many impressive high notes, and one in particular got the whole audience to respond enthusiastically. Not only was the audience applauding, but during tUnE-yArDs’ single, “Bizness,” everyone was dancing and singing along. Before the end of the performance, Garbus stated that Austin was one of her favorite cities in the country. The crowd seemed to feel similarly about the band. Many waited at the Blue Stage for hours just to snag a good spot for Childish Gambino. A multi-talented artist, Childish Gambino is the stage name of Donald Glover who has worked as a writer for the show 30 Rock and as an actor on the show Community. Gambino’s song, “Freaks and Geeks,” seemed to be his most famous. There was a sea of crowd surfers, and those in the audience not singing along were a rarity. Another highlight of the performance was his freestyle when there were technical difficulties with performing the previously planned song. He ‘flowed’ about his performance, making references to M83 (a popular indie band that had just finished their set on another stage), Breaking Bad (a television show), and FunFunFun Fest. “My Shine” and “Hero” also were crowd pleasers. Gambino’s genius lies in his extremely intelligent lyrics, including many pop culture references and hilarious metaphors. Including more than two dozen shows, FunFunFun Fest was, for many, a power example of what makes the music in the live music capital of Texas strong and well, fun. Portland, Oregon-founded alternative rock band The Dandy Warhols (singer-guitarist Courtney Taylor-Taylor, guitarist Peter Holmstrom, keyboardist Zia McCabem, and drummer Brent DeBoer) are noted for their classics “Not If You Were The Last Junkie On Earth” and their most famous “Bohemian Like You,” and have found success with their music featured in films, television shows, and commercials such as The Replacements, MythBusters, and a Ford Focus car range commercial. 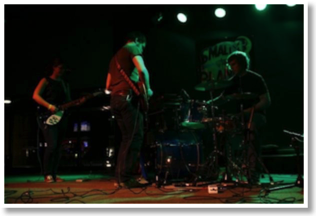 Austin’s casual nightclub Emo’s was an appropriate fit for the band’s brand of psychedelic alternative that meshes The Velvet Underground, Primal Scream, and the Pixies. Hypnotic and free-flowing as their music, the band seemed to undergo a lull that kept them concentrated on what they needed to deliver to their audience. A number of musical techniques were employed: long instrumental passages, charging guitar-driven rock, and screeching electronic effects alongside angst, words of redemption, and hallucinatory vocalizing. 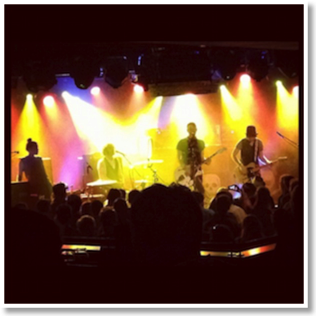 “I Am Free,” from their latest album This Machine (2012), had regular cadence, while the entrancing “I Love You,” from the 1997 outing …The Dandy Warhols Come Down, featured a building, lyric-less coda. While other songs such as their staple “We Used to Be Friends” and “Everyday Should Be a Holiday” were spotlighted, “Holding Me Up,” from 2005’s Odditorium or Warlords of Mars, became the centerpiece: screeching guitars and electronic effects, red-orange lights flashing down to give the impression of fire, a rotating disco ball projecting white circles against the black backdrop of the curtains, and audience participation through clapping. One might call their music “psychedelic-tinged alterna-cool”: they exuded a cool vibe and remained focused, seemingly undisturbed by their surroundings; it was just them and their music, lost in the high of their performance. Warren Franklin & Empire! Empire! The night was full of musical energy from the group Warren Franklin from Rockford, Illinois, and the band Empire! Empire! (I Was A Lonely Estate). Warren Franklin’s driving hit “Bro Downs Know No Bounds” reached out to the concertgoers with his piercing, catchy vocals, occasionally on the verge of yelling. The recording of this track features acoustic guitar, tambourine, and trumpets. However, for the live performance he trades an acoustic for an electric and the tambourine and trumpet for drums and a bass. “Please Return,” an austere song, lamented a lost lover. This theme of missing his ex-girlfriend is a common theme throughout much of his work. He continued on to play “Let Me Down Easy” and “Your Heart Belongs To The Midwest,” but the most popular among the audience was “Some Form Of Irony.” With cynical lyrics such as, “Honestly, no one’s gonna care about the songs I sing / Unless they can include some form of irony / No one’s gonna care about the truth,” the song is a biting criticism of aspects of today’s culture that resonate with many. The track begans softly and honestly and built to a fist-pumping climax. Empire! Empire! (I Was A Lonely Estate) performed soon after Warren, slowing down the vibe of the show, but certainly not dominating the quality (or the length of the song names). Harmonized guitar riffs began the set (and most every one of their songs). The crowd could be seen bobbing their heads to the music’s slow, driving sound. “The Loneliness Inside Me Is A Place” offered a contemplative reflection; “The truth is much more complicated than that / And I am still trying to learn how / Time is a gift as much as it is a burden.” The honest tone in Keith’s voice shown though the evening’s performance. Another crowd favorite was “Everything Rests on Your Small Shoulders” – one of Empire! Empire!’s peppier tracks. The somber and beautiful closing was named “I Would Have Stolen You a Whole Orchestra.” The performance was both serious with longing lyrics and whimsical, when at one point while tuning the guitars, the bassist, Bo Sonnenberg, told the audience jokes from Laffy Taffy wrappers. It was just the right amount of each that led to the audience enjoying a night of music.